FIANNA FÁIL TDs have voiced overwhelming opposition to the proposal for a partnership government with Fine Gael and independents at its parliamentary party meeting today. Party leader Micheál Martin and his TDs have met to discuss the offer put forward by Enda Kenny last night for a full partnership government involving Fine Gael, Fianna Fáil and independent deputies. Sources in the meeting said there was strong opposition voiced by TDs who said the party cannot go into government with Fine Gael after it was rejected by the electorate in February. Martin is now meeting with Kenny in Leinster House this afternoon and is likely to tell the acting Taoiseach that Fianna Fáil cannot accept the partnership proposal and will only support a minority Fine Gael government. 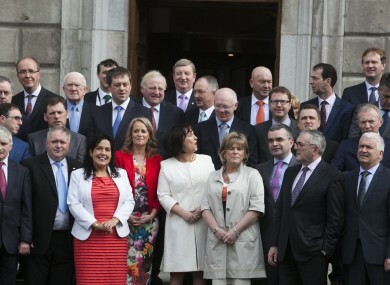 However, Martin will also continue his efforts to try to form a minority Fianna Fáil government. The two party leaders are holding talks in a meeting room which lies between Leinster House and the entrance to the ministerial corridor in Government Buildings. Kenny is due to brief Fine Gael ministers on the latest developments later today. The rejection of the Fine Gael proposal comes as little surprise after several Fianna Fáil TDs said prior to the meeting that they did not believe it would be endorsed by the party. Meanwhile, Fine Gael’s parliamentary party also met today with TDs strongly backing Kenny’s decision to offer Fianna Fáil a partnership government. Really positive Parliamentary Party meeting, I and the party fully support the Taoiseach's initiative to form a partnership Government. There was strong backing for the Taoiseach at the meeting, with few dissenting voices. In a statement afterwards, Fine Gael’s acting chair Catherine Byrne said that TDs and Senators overwhelmingly supported the partnership government proposal as “the best way to provide a stable and lasting Government to deal with the issues concerning people and the challenges facing the country”. But Carlow-Kilkenny TD John Paul Phelan spoke against the deal. He said he could not look friends who were forced to emigrate in the eye again if he voted Fianna Fáil back into government. Kildare North deputy Bernard Durkan was also said to have been opposed to the proposal. Email “No deal: Fianna Fáil TDs overwhelmingly against partnership with Fine Gael”. Feedback on “No deal: Fianna Fáil TDs overwhelmingly against partnership with Fine Gael”.